The final game was, fittingly, in keeping with the rest of the campaign. Rangers were mostly uninspiring against Dunfermline, but probably ought to have won the game. The 1-1 scoreline ensured that the Ibrox side finished the season unbeaten in the league and if many of the displays were far from breathtaking, it is a commendable achievement nonetheless. In many respects, the encounter at East End Park reflected many of Rangers' experiences during the past 11 months. There were glimpses of potential in Fraser Aird, moments of rashness and haplessness from Bilel Mohsni, an industrious if limited display from Ian Black, solidity from Jon Daly, a lack of substance to Arnold Peralta and the nagging sense that Nicky Law has misplaced so many of his certainties that he is cautiously plodding through games. Collectively, Rangers have been far out of the reach of their League One opponents, even if on occasion their individual encounters have been closely contested. If there is an overriding influence to the team's ability to grind out results, then it is attitude. The title was won in March, yet the final eight games brought seven victories and a draw. Criticism has never hesitated to gather round Rangers, and supporters were particularly irked by the League Cup defeat by Forfar at the beginning of the season, the Challenge Cup final loss to Raith Rovers and, despite a lively, committed performance, the Scottish Cup defeat by Dundee United. Having managed through the crises of last season, then the renewed conflict around the club in this campaign, Ally McCoist has found his ability and judgement questioned. There are legitimate enquiries, such as why Peralta plays on the right of midfield when he arrived at the club with a reputation for being a tigerish central midfielder; why Law's form has regressed over the course of the campaign; why fewer younger players have featured in this campaign? McCoist has, though, delivered the principle aim, which was to take another step towards the top-flight, and at a time when the club remains in turmoil. During both halves at East End Park, Rangers supporters held up red cards in protest at the board, and sang chants against them. The club's finances are in a critical state, the chief executive Graham Wallace has been unable to rouse or inspire the support - confirmation of his bonus came at a time when admin staff are being laid off, and while the players receive no bonus for winning the league - and no solution has been achieved. Rangers have required equity funding, to underpin the climb back to the Premiership and to re-invest in areas of the club that desperately need new financing, since before last December's annual general meeting. To have reached May without a funding plan in place suggests an inability or unwillingness to address this major issue. An extraordinary general meeting could be called at 28 days' notice to allow shareholders to vote on whether or not to grant the board powers to issue new shares in a rights issue. It is by this method that the former Rangers director Dave King wants to invest in the club, and he hopes his financial strength will see him take overall control. Supporters have grasped that they have the power to influence events, and season ticket renewals remain in the very low thousands, with less than two weeks before the deadline. If the majority of fans withdraw their financial support, the board will likely have no option but to seek a rights issue or enter administration - as highlighted in both last March's interim accounts and Wallace's business review. This uncertainty continues to grip the club, so that much of the on-field drama has become secondary. McCoist maintained a blunt analysis throughout the campaign, though, of recognising that every flat display only further emphasised the rebuilding work that needs to be done. In Cammy Bell, Lee Wallace and Lewis Macleod he has three players who could contribute to an eventual title challenge in the top-flight, if that stage is reached again in the coming season or two. Aird could continue developing, while Nicky Clark could learn the shrewdness and experience to make his impact more meaningful. Lee McCulloch and Jon Daly are approaching the end of their careers, though, while Black, Law and Dean Shiels need to prove that they can rediscover the refinement of touch and movement that they showed when they played at that level previously. In truth, Rangers remain a work in progress. This was an improvement on the campaign in the bottom tier, but also fell short of the supporters' expectations, at least in terms of performances. Results have, however, been remarkably consistent. 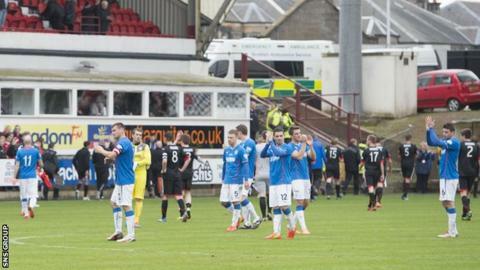 The summer needs to bring a period of renewal, although finances might dictate that only cuts are implemented, with Emilson Cribari, Kyle Hutton, Andy Little, Chris Hegarty and Steve Simonsen all out of contract at the end of this campaign. The journey continues. It has not always been enlightening, but there have been restrictions, too, with the football department needing structure and investment, not least with the ongoing absence of a chief scout. Like everything at Rangers, though, that is dependent on a change in the ownership dynamic amongst the shareholders. Until then, all of the noise and impact around the club has to be endured.